WILLEMSTAD - In honor of celebrating her maiden voyage on June 6, 1988, and for calling Anna Bay her home for the past 30 years, as well as for the numerous acts of support in the local community, the government has declared June 6 as the Freewinds Day. 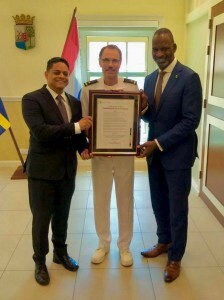 In the picture Captain Ken Weber receives the proclamation from Prime Minister Eugene Rhuggenaath and Steven Martina - Minister of Economic Development in advance, as Freewinds is offshore. Wishing all who work and sail on her continued success!